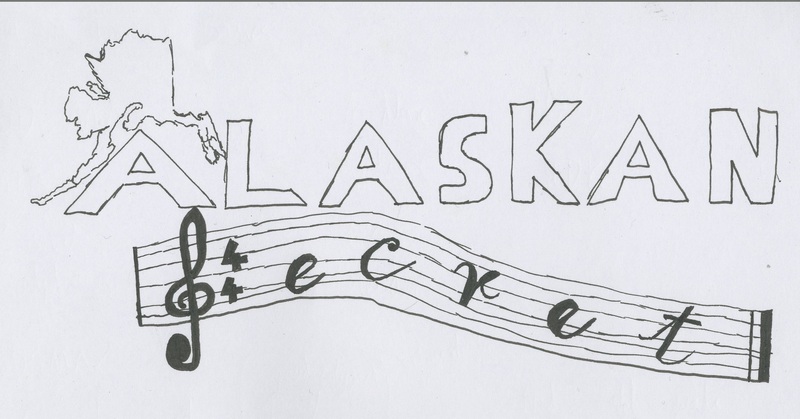 Introduction to Gaming- Group Project “Alaskan Secret”. In todays session of Introduction to Gaming, we was told that we are going to be assessed on a small piece of work (well dependent on how much time you want to put into it), this project would be a group task but we would be allowed to pick who we would work with to test our group work skills and see if we have a comfort zone. To decide this the pick of a card was needed, numbers Ace-6 would be a group, then 6-8 and then 9-kings. I drew the King of clubs, i shortly found out after the rest of my group was Phil (drew king), Dave (drew 9) and Victor (drew 9) this group i knew would be good to work with before we even started; this immediately lead to us deciding our team name would be “Kings of the Nine” we also drew a logo which had a crown above the name and text written as “King of the 9ine” a clever logo design i thought. Regardless of how professional our team logo was it was irrelevant to the task as we was currently waiting for our 3 topics of choice. The topics were a random arrangement of everything and anything (from girls night out, Cornish pasty to under the sea, zombies) and whatever we had chosen we had to use our creative minds to follow the design process to create a game from it. We picked out from a hat the topics of “Haunted/ Ghost”, “Musical Instruments” and “Alaska”; these topics pleased us as so much can be done with haunted/ ghosts as it can be totally myth or rumour nothing factual has to be considered in this case. Musical Instruments could be used well as a range of time periods involve music throughout history. Then Alaska was possibly the toughest of 3 topics chosen but we decided to set the game in Alaska used Alaskan history to assist us in the making of the game. The process we had to follow throughout the day was: Ideas Focus, Plan, Write Up, Mechanics Ideas and then finally Visuals of the game (3D, Sketches or Demo). We was sent on our way to prepare ourselves and fully get into our task set to us. We began brainstorming ideas immediately, keywords that appeared regularly were: Haunted, Scary, Soul, Mansion, Peace, Songs, Floating, Instruments, Russian (Alaska research reference), Musician, Action buttons, Classical, Realism, Consequences, Play to Calm. These are a few of many common features we had to take into consideration and try to piece together a playable game from. In the end I did a small write up on the games overview possibly even a selling pitch: We have a Russian Musician who was mysteriously murdered in his mansion, he is now haunting his house causing instruments to levitate/ fly all over, you have to venture through the spooky haunted house collecting each instrument and playing that instruments part in his most famous song. As you progress further through the game you piece together what was a musical mess (symbolising his rage) to a piece of art (finally letting his soul rest). So with this brief write up we continued on with the design process and that was the mechanics of the game. Now I already briefly mentioned the mechanics in my short write up but just to clarify this is what we went through ideas wise so it wasn’t just the first idea out of our heads: Guitar hero style note player, Taiko Drum Master style note player, Action buttons (hit button specified on screen before timer runs out to play notes), find the actual separate note sheet in the house for the specified instrument and then finally something totally random also unique which would be to use motion controllers to level out the note strip to make the music sound correct rather than distorted. Our final choice was the action buttons but in a Taiko drum master style, which is a side scrolling bar of notes that you have to correctly match the combinations on the screen to the buttons on your controller to complete the piece, if you fail below a certain percentage consequences will happen (we wasn’t too sure on what as of yet). My intention is to put this into Photoshop and fully do a graphic design on this product which I can also use in other areas of my modules as importance of graphics in games. With the logo finished to a sketched standard I was happy with I went to look at my peers work. Dave had just began his Sketch Up design of his flute, this flute caused a lot of problems for Dave but as he was doing prop design for his 3D Realisation course he wanted to design each process himself no matter the time period taken. This is the design of Dave’s flute coming along nicely, this could be the finished product but im sure he will add colour and other features as we progress further into this project in our own time. Nevertheless its a good looking flute which took him some substantial time to draw all these features on the flute, including the very precise note pushers for the flute. Then I moved onto Phil who had been doing a interior design of a random room in the house of what it mike look like in Sketch Up, then importing it into Photoshop to add effects and shading to the design. This is Phil’s finished product of the room, complete with one of the instruments a black grand piano. He also added some images into photo frames to give the room some art as im sure musicians appreciate art as music itself is an art. The bookcase was an idea pitched by most of us as we could use the books well if they were to fly off and hit the character every note missed. Firmly assured we was really getting well along with this a went to see how Victor was getting on. Victor was trying to do the Level Design for the interior as well as the exterior all in one lesson, to do this would require much focus and no problems to arise (which they did) he was explaining to me about how the walls kept disappearing when he tried to erase a line even though he had segregated properly. Due to this I agreed with the rest of the group I would take our original sketch and do purely the exterior of the House just to take a work load of Victor so he could focus purely on the 1st floor and 2nd floor layout. Below are the finished products of Victors work with well structured rooms which does look like a house interior layout. 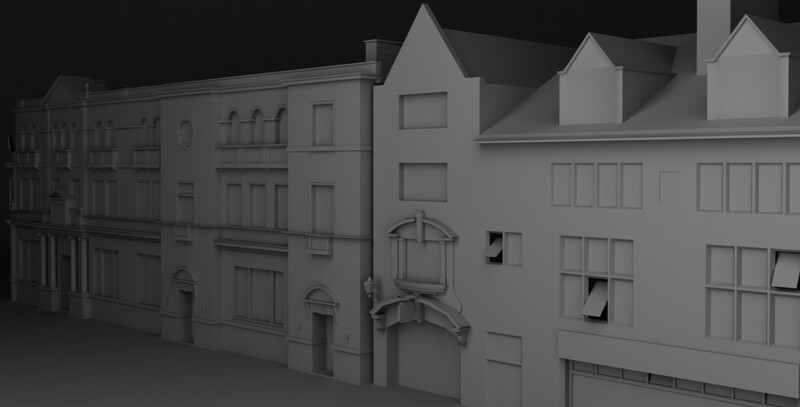 This is a concept of the haunted house that we have chose to include in our project game of “Alaskan Secret”. This was obviously slightly different to what Victor had designed for on his layout but it could still be incorporated easily with scale and a bit of extra time as i have already fitted a spiral staircase. 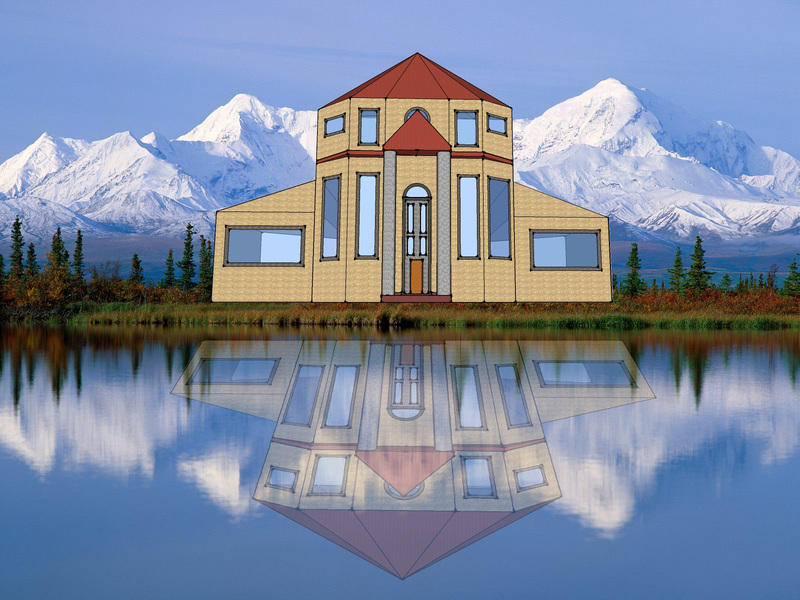 To conclude Phil wanted a JPEG 2D export of my house at a perspective angle so he could use it in Photoshop to set it on an Alaskan background and reflect it in the water using opacity. This was the finished product which we all thought looked pretty fantastic as a concept design. This rounded up our days work on the Group Project “Alaskan Secret” I was very pleased with my own contribution but more so with how well we worked as a unit to create a solid design for our game. Paul suggested at the end that due to this being assessed we may want to continue this in our own time possibly to gain a few extra marks but not to focus everything on it as its not a substantial chunk of our marks it was just a mini brief exercise. I really enjoyed this lesson it got my creative mind going and I took a lot away from the lesson in terms of how strong I am in a team environment and my personal skills so far in software/creativity. Categories: Games Design: Introduction, Modules | Tags: 3D, Alaskan Secret, Alexander Borodin, art, Drawing, Group, Haunted, Musical instrument, PHASEgaming, Photoshop, SketchUp, youtube | Permalink.